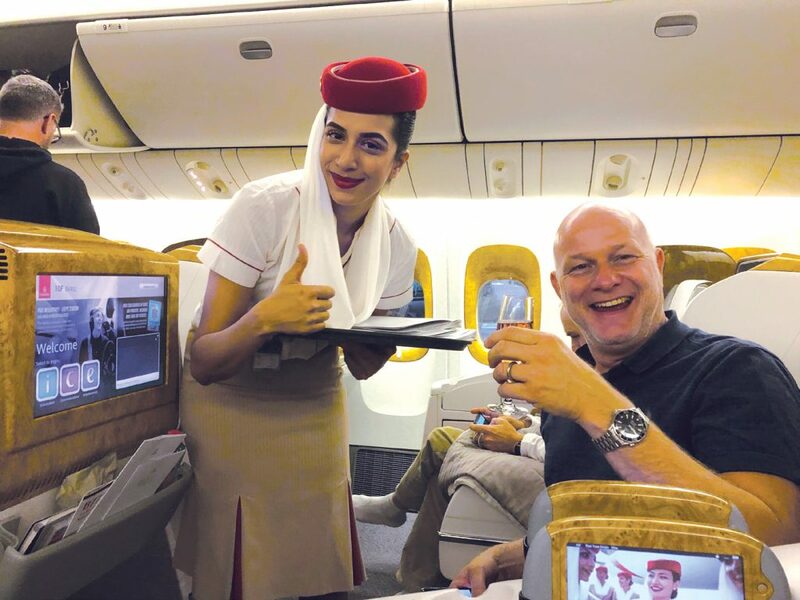 Helmut Gottschalk, my auditing partner, on an Emirates flight from Dubai to Singapore. It’s 9:53 p.m. over the Andaman Sea on Nov. 9; 12:53 a.m. on Nov. 10 in Singapore; 8:53 p.m. in Dubai; and 11:53 a.m. the morning before in Sunset, South Carolina, my home base — all of them waypoints on this special air marathon. Firmly ensconced in seat 47F on Emirates Flight 355 from Singapore to Dubai, cruising at 554 mph (Mach 0.83) at FL 400, this is my first flight on an Airbus A380-800. Westbound chasing the sunset that we will never catch, I have just helped conduct three International Standard for Business Aircraft Handling (IS-BAH) audits in six days, which involved three nights in hotels, and now I’ll spend my third night in flight heading from Dubai to Washington Dulles International Airport (IAD) on another Emirates A380. This assignment has taken me halfway around the world and back again. When I retired from the cockpit of a beautiful Gulfstream GIV-SP in 2008, I thought it might be important to me to remain engaged in some other aspect of business aviation, a community that had given so much to me since I began my career in 1967. Within a year, I became qualified as an International Standard for Business Aircraft Operations (IS-BAO) auditor. The decade that followed has been an amazing mixture of exploration and learning. In 2014, I was additionally certified to conduct ISBAH audits. IS-BAH was introduced in July 2014 by the International Business Aviation Council (IBAC). The program is designed to provide ground-handling service providers (GHSPs) with a means of measuring their conformity to a focused set of standards put forward by the International Civil Aviation Organization (ICAO) and business aviation best practices, concentrating on the development and progression of the GHSP’s safety management system. Akin to ISBAO, IS-BAH’s intent is to assure business aviation operators that the FBO or handler they are using is striving for excellence and continual improvement in its oversight of service and safety. This particular audit plan called for two auditors — me as lead auditor in partnership with Helmut Gottschalk, co-managing director with AeroEx.eu — to fly to Dubai and assess Jet Aviation’s two FBOs’ conformity with ISBAH on Nov. 6 at Dubai International Airport (DXB) and on the Nov. 7 at Al Maktoum International Airport (DWC). Then on to Singapore during the night of the 7th, to arrive on the morning of the 8th and out to Seletar Airport (XSP) for a one-day audit of Jet’s FBO at that location. My home return was scheduled for 9:00 p.m. on Nov. 9 from Singapore through Dubai to Dulles. Jet Aviation Europe, Middle East and Asia had applied to become an ISBAH registered FBO at the Stage 2 level in summer 2018. The General Dynamics- owned chain had contracted with AeroEx.eu, a Swiss business aviation auditing firm, to conduct the IBAC-mandated number of audits that would verify conformity to IS-BAH for its regional network. Joel Henks, comanaging director, reached out to me after they were awarded the contract and asked if I would take the assign­ment as lead auditor. I had previously worked with AeroEx.eu during fall 2016, conducting Stage 1 IS-BAH audits of Jet Aviation’s handling operations in Jedda and Riyadh, Saudi Arabia. I was therefore familiar with the company’s Ground Operations Manual, Standard Operating Procedures and Emergency Response Plan. The Dubai and Singapore audits, al­though aggressively scheduled, were efficiently conducted through a com­prehensive documentation conformity review prior to the actual audit dates. With the documentation completed in advance, Helmut and I split up at each site to uncover evidence of conformity through records review, interviews, facility inspections and airside obser­vations. I completed the necessary pa­perwork and submitted all of the audits for review to the IS-BAH audit review team when I returned to South Caro­lina. The 14.5-hr. flight from Dubai to Dulles provided ample time to fulfill that obligation. It was truly amazing when we landed at IAD to realize that I was aboard an A380 that represented the 100th delivery to Emirates Airlines. The capability of commercial aircraft to conduct extreme long-haul flights is matched today by business air­craft from manufacturers including Bombardier, Dassault, Embraer and Gulfstream. In reflecting on the days when I was just starting out in busi­ness aviation, our Gulfstream GII was certainly capable of conducting a circumnavigation of the globe, but in 6:20-hr. intervals. And doing so took quite a bit of advanced planning, communication via cable and telex for not only landing permits but overflight clearances, fuel uplifts and catering re­quests. The EU did not exist then, which necessitated obtaining permission from every national aviation authority in Eu­rope to overfly their sovereign territory. It’s been so interesting to reinvent myself and I look upon this latest as­signment with a mixture of challenge and curiosity as to my continued viabil­ity within an industry I truly love. This particular assignment also reminded me of my flying days, which included many trips through Dubai on the way to Singapore. My first flight to Singapore took place in fall 1974. I had joined the W.R. Grace flight department based at New York’s Westchester County Air­port (HPN) earlier that year and I was assigned to a 21-day round-the-world trip that October. Seletar was a little country airport back then and tightly controlled by the Singapore military, whose validation of our landing permit request had arrived several weeks prior to departure. That’s all ancient, BPC history, that is before personal comput­ers gave us the opportunity to commu­nicate instantly with the world. Instead of uploading an entire flight plan for a flight via the FMS, the Lit ton LTN 51s onboard the GII would only accept nine waypoints and No. 9 was always the destination airport. Each waypoint entry was made via inser­tion of full latitude and longitude coor­dinates. Weather forecasts as well as winds aloft data were typically based on information that was often more than 24 hr. old. Updated weather was received over HF when airborne via published VOLMET frequencies. Bustling Seletar Airport now offers FBO services to business aviation opera­tors through Jet Aviation and four ad­ditional handling service providers. The airport has been transformed from the old “colonial days” when a GII was the most capable means of international busi­ness aviation travel. In similar fashion, Dubai International was simply a runway in the desert adjacent to the Persian Gulf. As for that sunset, it appeared just be­hind us during the approach into Dulles. Good morning!